It’s taken me two days to start writing this: I’ve nearly lost the will to live with it, honest. So here we go… as you will recall, dear reader, on actually reading Clause 16 of the Equalities Bill, as opposed to the spin around it… Serious Questions Were raised In Our Minds. Namely, where was this protection for breastfeeding in public spaces at all? So, I suggested that everyone write their MP, as I did, pointing out how worried they were by the implications in Clause 16, and asking for clarification on one thing: if a mother was asked to leave premises, did she have to go? Answer that she did, came via Unicef UK, a ‘supporter’ of Clause 16 who was involved in discussions about this Bill at Government level. 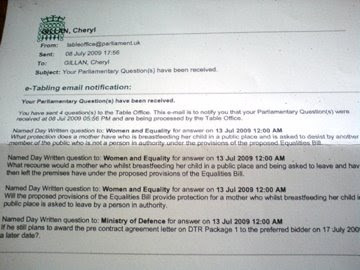 The MPs sent the letters for clarification, to Harriet Harman at the Equalities Office, and they were replied to by Vera Baird, Solicitor General, QC, MP, C.R.V.W. (Can’t Read Very Well). Vera sent a form letter back to everyone, thanking them for their support for the Bill and saying how great it was they agreed with the Government. Lots of Mums then got very annoyed, including Emily Pulling, who replied back to her MP about the MP not noticing the sleight of hand, and how she wanted An Answer. Emily’s MP, Cheryl Gillan, was also then quite annoyed, it seems. She replied back to Vera Baird, and repeated Emily’s request for clarification. Vera Baird, Solicitor General, QC, MP… again sends the “Thank you very much for supporting the Equalities Bill” letter. She even rearranges the opening paragraph slightly, to show she’s done something a wee bit different. So… she is sent a letter by an MP, asking her to address the issues she did not address the first time… and she responds with the same letter. Honestly, I can’t even laugh. Seriously, it’s just not funny anymore. I suppose we shouldn’t be surprised, this was the Government that when MPs wrote about Baby C, gave their MPs false information about meetings that had happened with myself and others. Lying to MPs is seen to be quite a big thing… but strangely, here we are, a few months later, and Government Ministers are ignoring MPs requests for clarification on a Bill they want the MPs to vote for! Cheryl Gillan, bless her cotton socks, didn’t take this lying down. She immediately tabled questions to the Government, on the Bill! Thanks Cheryl, we do appreciate that! Here’s the letter Cheryl sent back to Emily, with Vera’s “I have my fingers in my ears and I’m going La-La-La loudly” reply…. I have received a response from the Solicitor General at the Government Equalities Office dated 1st July, 2009, in response to further enquiries made on your behalf. As you will see from the comments, despite requesting further clarification from the Government, the Minister has chosen to repeat her initial comments. I am sorry that the Minister has not been more forthcoming in replying to you. Please do not hesitate to contact me if I can be of further assistance to you. What protection does a mother have who is breastfeeding her child in a public place and is asked to desist by another member of the public who is not a person in authority under the provisions of the Equality Bill? What recourse would a mother who whilst breastfeeding her child in a public place and being asked to leave and then left the premises have under the proposed provisions of the Equality Bill? 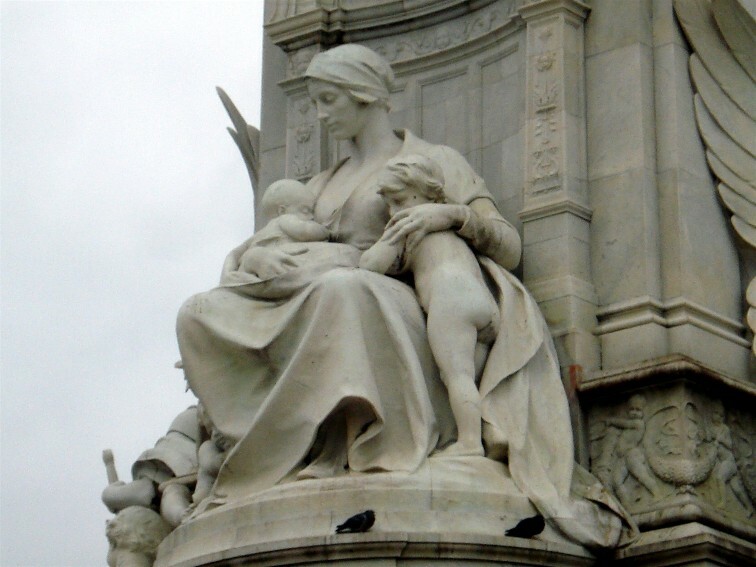 Will the proposed provisions of the equality Bill provide protection for a mother who whilst breastfeeding her child in a public place is asked to leave by a person in authority? These are fabulous questions. They go to the heart of the issue – public space. Not ‘premises’, where goods and services are being delivered. Thank you Cheryl!!!! There is an expectation that MPs will receive a written response within 7 days of posting. Tick tock tick tock tick tock… We’ll keep you posted. They should be answered by the 13th. So, on to Vera. How do you solve a problem like Vera? How to you catch a cloud and pin it down? Well, I suggest it’s time we write to Vera, directly, and register that we are COMPLAINING about Clause 16, and REQUESTING a clear answer on the issues. I’m writing to you in your capacity as Minister at the Equalities Office and have cc’d this communication to my MP, Alistair Burt. Myself and several friends have requested information from the Equalities Office via their MPs. All, except myself, have been sent by return a letter from you, as this is your area of authority. Without exception, your return letter has not answered their points, or even acknowledged their enquiry. Even when prompted again by an MP to respond to the request for information, you responded by once more sending the same form letter. In fact, when faced with several letters stating concerns about the upcoming Equalities Bill, you responded to these concerns by thanking the sender for their support. Therefore, let me make this communication exceptionally clear. THIS IS A LETTER OF COMPLAINT. I wish to register my objection to clause 16 on the Equalities Bill. I wish you to know, as the Minister involved, that as a breastfeeding mother, I am stating that I DO NOT SUPPORT Clause 16 of the Equalities Bill. If you now send me the form letter thanking me for my support, I’ll know you hold your electorate in the utmost contempt. It is a basic tenet of communications with Ministers, by either MP or voter, that you bother to read, and respond to their communication. I expect you to respond to me clearly and competently. I expect you to acknowledge that I have registered with you that I do not support Clause 16 of the Equalities Bill. THIS IS A REQUEST FOR CLARIFICATION. I repeat the request that has been forward on to your several times over the past few weeks, by several MPs acting on behalf of their constituents, and which you and your office have utterly ignored. Could you please confirm that under the provision of Clause 16 in the proposed Equalities Bill, that if a mother who is breastfeeding in England & Wales is asked to leave premises providing her with goods or services, she must leave? I do not wish to hear an answer that states you think that as it is (note IS, not will be) an offence to do so, no person in authority on those premises would ask a mother to do so. I’m not interested in that response. I’m interested in the answer to the question: if she is asked to leave premises by a person in authority… must she go? The answer is either a ‘yes’ or a ‘no’: if that helps you narrow down and formulate your response. Now, some interesting things to say about all this. First of all, the photo of the statue at the top, is what the Royal Family see when they are on the Balcony at Buckingham Palace. I thought it was ‘apt’ for another wrangle with politicians. Secondly, there have been a couple or three MPs signing the epetition. Including Clare Short, who is the MP for Birmingham that covers the Cathedral (which is hosting one of our regional Breastfeeding Picnics). Gosh, I do hope there is some good news on this soon, or even just a response. It’s such a grind having to force the powers that be just to read their bloody letters! My MP, Alistair Burt, confirmed he’d had the ‘thank you for your support’ form letter and had been drafting a response back to Vera Baird requesting a more appropriate response. This is exactly what I thought had happened. Nice that at least one MP, had actually read the incoming response, and compared it to the letter that instigated it. Well Done Alistair!!!!! Maybe with Alistair & Cheryl on the case, we might get a response. 🙂 If you haven’t done so – please prompt your own MP. I know it feels like pushing a rock up a hill, but we need to keep making people accountable. Flagging as the responses are so stupid and incomprehensible is how they wear us down! I got the letter! (Dated 4th June??? About a month before I contacted my MP)Do I win some sort of prize?